In old version of Windows Live Messenger or MSN Messenger prior to Windows Live Messenger 2011, any friend requests to add you as a contact to communicate or instant messaging will pop up and display a notification dialog box which allows user to accept or reject the request. In Windows Live Messenger 2011, such notification popup or dialog message no longer available nor offered by the Messenger client. As a replacement, only a text link is displayed on the bottom of contact list to alert Windows Live Messenger 2011 user on any incoming friend requests. Thus, if you have known that somebody has added you as friend, but is wondering why you don’t get an alert to trigger option to accept or reject the friend, just look to the bottom of the contacts list, where the words similar to “You have x invitations” appear on a yellow background strip box. Just click on the link indicating invitations that waiting for you to approve or reject. 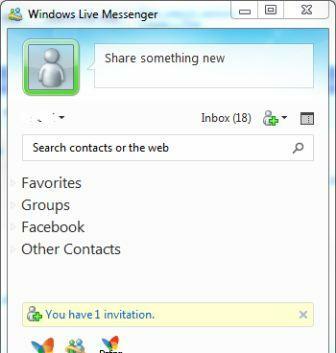 Then, Windows Live Messenger will offer you options to either accept or reject the friend requests, whether to favorite them, and to place the friends into which categories (groups). Tip: If you face a problem where there is not even the yellow invitation notification bar appearing on the Messenger client below the friends list, the workaround is to just add the friend from your side. It’s equivalent to approve and accept the friend request from the friend, and the contact will appear on the contact list once done.